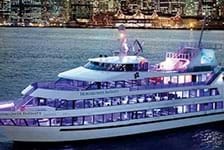 For unparalleled views of New York City, take a harbor cruise with Hornblower Cruises & Events in NYC. Their luxurious fleet of boats offer inside and outside seating so take a sightseeing tour any time of the year. Choose from a dinner or brunch cruise or set sail at sunset and enjoy a live band, cocktails, and dancing. Hornblower Cruises offer a unique and fun way to see New York City.